Get up to $50 BACK. 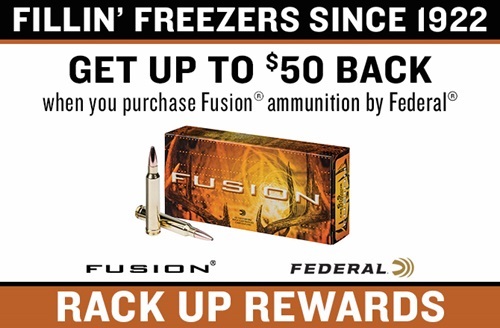 Purchase 1 box of Fusion rifle ammunition by Federal and receive $5.00 back. Limit 10 boxes/$50 per address. 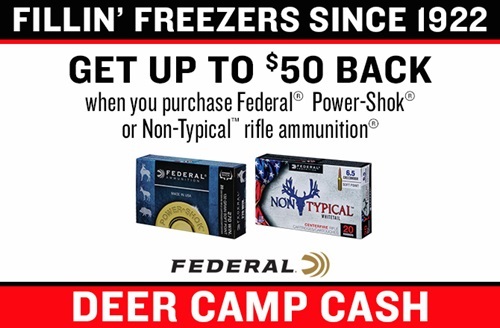 Purchase 1 box of Federal Power-Shok or Non-Typical rifle ammunition and receive $5.00 back. Limit 10 boxes/$50 per address. 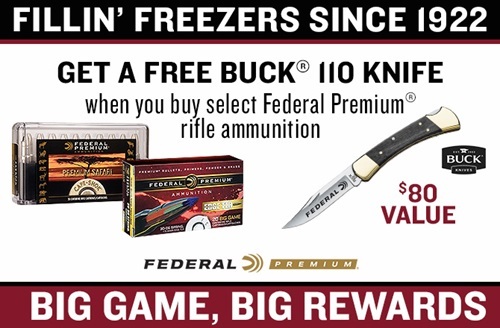 Get a FREE Federal Premium branded Buck 110 Folding Hunter Knife ($80 retail value) when you buy at least 2 boxes of Federal Premium big game/medium game rifle hunting ammunition. Offer Includes Edge TLR, Nosler AccuBond, Trophy Bonded Bear Claw, Trophy Bonded Tip, Trophy Copper, Sierra Gameking, Nosler Ballistic Tip, Nosler Partition, and Premium Safari Cape-Shok ONLY. EXCLUDES Varmint loads, .223 and .224 ammunition. Limit 2 free gifts per address. Get up to $40 BACK. 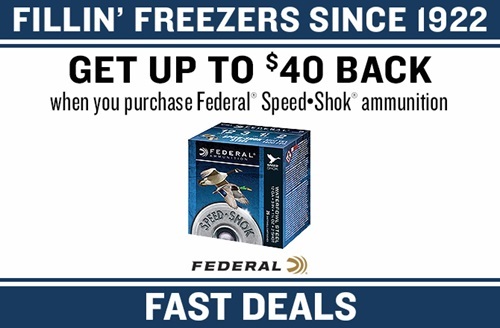 Buy at least 2 boxes of Federal Speed-Shok steel and receive $2.00/box. Limit 20 Boxes. Maximum $40 per address. 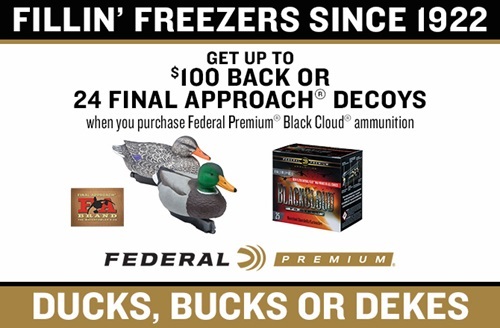 Get up to $100 BACK or up to 24 Final Approach Decoys, when you buy Federal Premium Black Cloud ammunition. EXCLUDES Federal Premium Black Cloud TSS. Limit 20 boxes (2 cases). 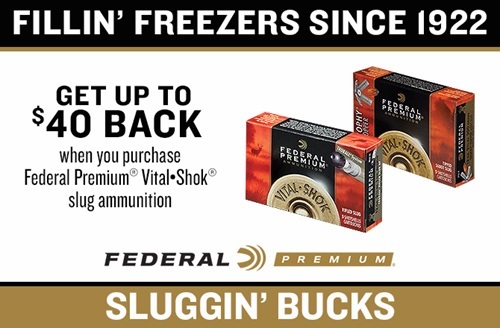 Get up to $40 BACK when you buy qualifying Federal Premium Vital-Shok slug ammunition. Offer includes TruBall Rifled Slugs and Trophy Copper Sabot Slugs. Maximum reward $40 per address. 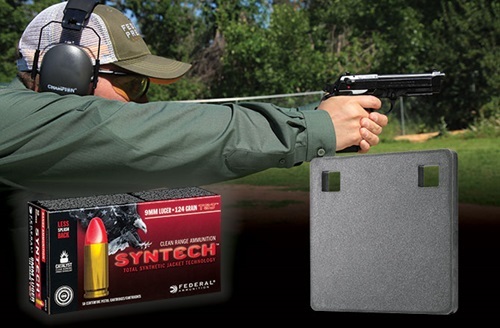 Purchase 3 boxes of American Eagle Syntech ammunition to receive a Champion 4” steel target. Limited to two (2) free targets per household. 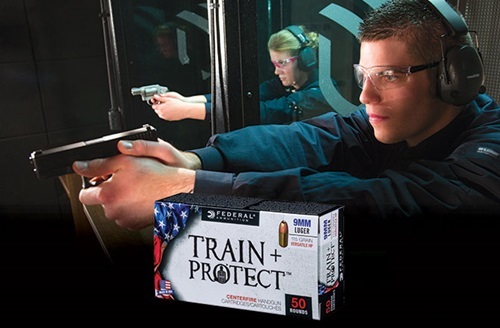 Purchase four (4) boxes of Federal Train + Protect ammunition and receive the amount paid for the fourth box back. Rebate calculated off of the lowest purchase price of the four (4) eligibles boxes. Taxes and/or shipping and handling fees are not included in the eligible rebate amount. Rebate limited to the equivalent of five (5) free boxes per household.